All work and no play makes anyone a dull boy. Or girl. And while we’re all about growth and development – both as a company and as individuals – we think it’s important to take some dedicated time to celebrate our successes. Plus we like to make sure the Entura team have plenty of chances to just unwind together, and enjoy life away from their keyboards. Socializing as a team helps us to relax, build closer relationships, and generally create a stronger culture. It all goes towards a healthier, happier atmosphere at Entura Towers. But what does this mean, specifically? We’ll lift the veil a little bit, to give you a glimpse of what’s been going on over the last couple of months. 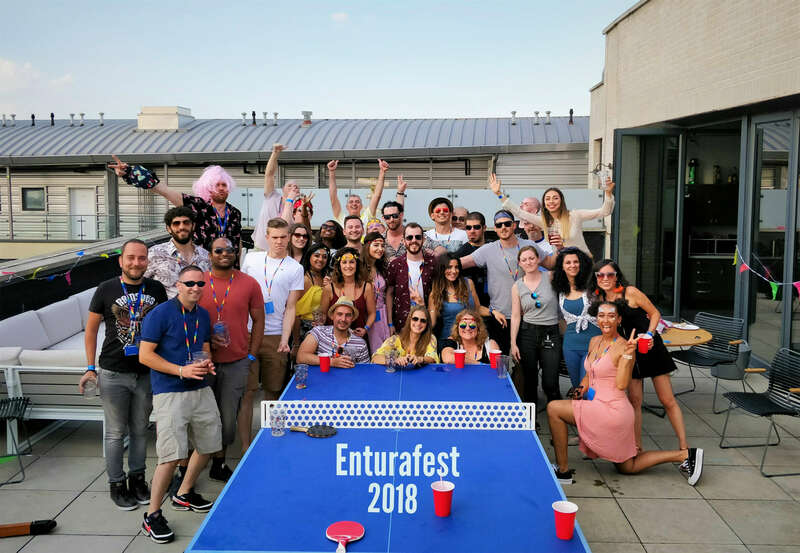 There ain’t no party like an Entura Party, and every year we have a Summer party – what we in the UK might call ‘a good knees up’. Music, food, drinks, and sunshine. And 2018 was a particularly good year, as we were blessed with spectacular weather for EnturaFest back in July. Picture a sunny (almost) rooftop terrace, with a music festival, raffle, blackjack, table tennis, and some truly superb fashion choices. British Summer bliss. Speaking of table tennis, our terrace played host to the very first Entura ping pong tournament back in June and July. Multiple rounds, heated knock-outs, and a worthy champion in the form of Jack. Fun for all (but particularly Jack). On a more regular basis, there’s a group of Enturans – led by Iwan – who bravely stride out every Monday to the local astroturf battlegrounds, for some five-a-side football. What have we learned from these ‘friendly’ clashes each week? 1) An hour of footie is great for blowing out the cobwebs after the weekend 2) Playing football is much more fun than silently sweating in the gym 3) Four-a-side games are exhausting. Meanwhile, those who wish to be more centred (and fitter, stronger, more flexible) enjoy weekly yoga sessions in the office. Having plenty of space means our yogis can really stretch out and shake off the day. And as our Yogi-in-Chief, Jo, would probably agree, there’s a lot less swearing than there is from the footballers. But back to celebrating: Tonight, we’re going to be enjoying one more party, as we officially launch the refreshed Entura branding. Another moment for us to pause and take stock – and we’ve invited a few of our UK clients to join us in the celebrations. So, if you haven’t taken a look at our new branding yet, just explore the website. And we’ll make sure we keep on updating this blog with news and insights from the team here. Come back for a visit.